The BPA takes its unique competitive gaming conference to the mountainsides of Southwest Pennsylvania from July 23-31, 2016, where the beautiful Seven Springs Mountain Resort welcomes us with a panoramic view, cool summer breezes and myriad indoor and outdoor activities to augment your boardgame adventures. Never before has WBC offered such an outstanding vacation destination package for the entire family. *Use Group code 8B08L7 when making your reservation to get this special rate. Please note that it applies only to hotel rooms. Suites, condos, cabins and chalets have separate pricing structures and need to be discussed separately with a reservationist. Junior Suites include a small refrigerator and are $139/night. This special rate provides maid service on alternate days, although fresh towels are available daily. REBATES: Seven Springs will reduce the overnight room rate in the hotel in the amount of $10 per night for stays of six nights or longer. This amount will be taken off the final night of stay. Early departures will forfeit this discount. This offer applies to hotel rooms only, not condos or chalets. TRIBUNE BONUS: BPA Elite members (Tribunes) will receive a free $20 Seven Springs gift card at the WBC Registration Desk (not at hotel check-in). Such members must be Tribune level members of the BPA by the end of WBC pre-registration on June 22, 2016. Rollaway Beds - A limited number are available at $20 per night. Refrigerators - A limited number of small refrigerators are available on a first-come, first-served basis for $40 per stay. Guests may bring their own mini-fridge if they prefer. Pet friendly rooms are available on the second floor of the hotel in the traditional section only. Pet fee is $20 per night. See bottom of the Seven Springs Lodging/Hotel page for pet guidelines and restrictions. DEPOSITS: A deposit equal to the one-night room rate plus 9% state and local taxes is required for each reservation. REVISIONS & CANCELLATIONS: Changes may be made to reservations up until 60 days prior to arrival. Within 60 days of arrival, there will be a $75 charge for changes to reservations and cancellations. RESERVATION SCHEDULE: WBC has a long history of early sellouts, but our room block at Seven Springs is substantially larger than past guarantees. Nevertheless, to ensure that our guests have adequate opportunity to make reservations, rooms will be reserved only on the following schedule. CONDOMINIUMS: A wonderful feature of Seven Springs is the availability of nearby condominiums on the property that can be rented for stays of two days or more once reservations are accepted for stays of that duration as per the above schedule. These are available in varying sizes of one-, two-, three- and four-bedroom units for the daily rate of $129 per bedroom. Guests who can group together with friends and family to cohabit these units will find these accommodations most welcome given their inclusion of kitchens and common living room areas that can enhance your visit. While having access to a car is recommended for condo rentals, it is not required as free shuttle service is available on property around the clock. Even when the hotel website lists no vacancies, condo rentals are available. Call 1-866-437-1300 to speak to a reservationist about the options. Multi-bedroom condos are rented to one individual who is responsible for payment for all bedrooms in that unit. Individuals getting together to share a condo, need to elect one amongst themselves to handle the payment for the entire group. To aid those looking for roommates or other groups to share a condo, contact acd@boardgamers.org to have your contact information listed on this page as looking to share a condo. Indicate your intended length of stay and notify us to remove your contact information once your needs are met. CHECK-IN/CHECK-OUT: Hotel check-in time is 4 PM. Check-out time is 11 AM. A $50 surcharge is added to late checkouts. SMOKE FREE FACILITY: The resort—inclusive of all hotel rooms, cabins, chalets, hallways, lobbies, meeting rooms, lounges and dining areas—is “smoke-free”. Our smoking guests may request ashtrays from the front desk for use on hotel lodging room balconies. PROHIBITIONS: No alcoholic beverages may be brought into any licensed function room within the resort. The hotel must dispense all such beverages on the property. Similarly, outside food and beverage is limited to consumption in guestrooms and not allowed in meeting space. For the safety of our guests, no cooking of any sort is allowed in hotel rooms, suites or function rooms. SHUTTLE SERVICE: Shuttle service can be arranged by calling 814-352-7777 Ext. 5000 for transportation to and from the Pittsburgh airport or Connellsville train station. The cost is $20 per person (round trip) to/from the airport ($10 to the train station) which is non-refundable and must be pre-paid. The airport with best access to Seven Springs Mountain Resort is Pittsburgh (PIT), which is served by American Airlines/US Airways, JetBlue, Sun Air Express, Allegiant, Southwest, Delta, United, and Air Canada. Airport information is available at flypittsburgh.com. Shuttle service to/from the airport can be arranged by calling 814-352-7777 Ext. 5000. The cost is $20 per person (round trip), which is non-refundable and must be pre-paid. Seven Springs is located within 200 miles of Pittsburgh, Washington, D.C., Baltimore, Cleveland and Columbus. Seven Springs is located approximately one hour’s drive southeast of Pittsburgh, PA, USA. It is easily accessible off exits 91 or 110 of the Pennsylvania Turnpike. Get directions. Seven Springs is located approximately 20 minutes from the Connellsville Train Station. Route information is available at amtrak.com. Shuttle service can be arranged by calling 814-352-7777 Ext. 5000 for transportation to and from the Connellsville train station. The cost is $10 per person (round trip), which is non-refundable and must be pre-paid. Seven Springs Mountain Resort has numerous restaurants, bars, and eateries on premises. Menus range from the most artistic meals, perfectly paired with exquisite bottles of wine to the best sandwiches and pizzas served with the coldest beverages around. For additional information view the Seven Springs Dining page. Additional restaurant options are available within 30 minutes in Donegal and Sommerset. Each year Seven Springs Mountain Resort hosts more than one million overnight and day guests who enjoy a vacation that includes the adrenaline rush of the Laurel Ridgeline Canopy Tour, the exhilaration of sporting clays, the stunning beauty and challenge of its mountaintop golf course, and the ultimate in relaxation at the luxurious Trillium Spa. See the Seven Springs home page for more details. 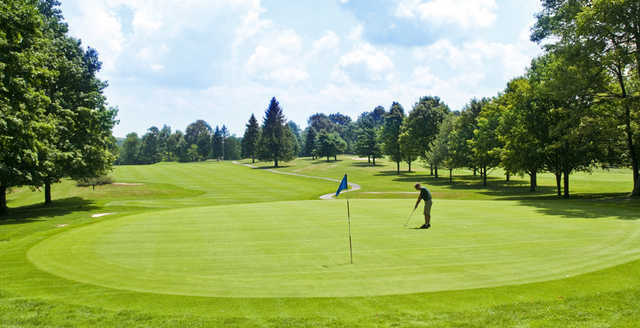 In addition, Seven Springs is only a short drive to many great attractions in the Laurel Highlands Region of Pennsylvania. You can spend one day at Frank Lloyd Wright’s Fallingwater, another at Ohiopyle State Park and so much more! See the Area Attractions page for more details. ©Copyright 2008-2016 by the Boardgame Players Association.